How does a “rhema word” affect my walk with the Lord? Will that be any different than a “logos word”? If you have not been following this series up to this point, please refer to the first article wherein I mention how the “rhema word” is generally understood. As a part of my research into this concept of the differences between the two Greek words, logos and rhema, I found articles espousing and explaining the differences. Following is a quote from one of those. The emphasis, which was in the original article, is an example of what I call an extrapolation for the purpose of building a doctrine. However, where is the authority to extrapolate from that definition to make “utterance” of an immediate aspect? There is none from the lexicographers I could find. 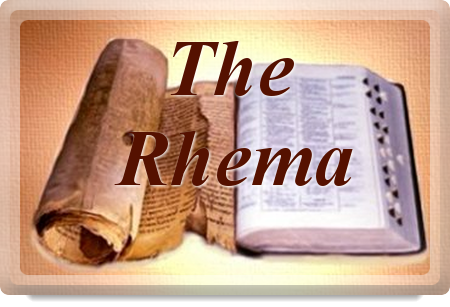 There is nothing that implies that rhema is an utterance outside of the scriptural content. This is something that I trust all believers understand. ALL SCRIPTURE is given by God, and we have that in the Bible. ALL SCRIPTURE is profitable. ALL Scripture includes both the logos and the rhema as contained within the covers of your bible. And, yes, we definitely need the Holy Spirit’s involvement in our lives. This verse drives most Christians who affirm the authority of the Bible as being God’s inerrant word, with 2 Timothy 3:16 (quoted above) as being primary. These two together form a bulwark of strength for believers who depend more on the Lord than they do on the vagaries of their feelings. Pay close attention to the verse from Hebrews. It does everything that a rhema word purportedly does. It’s sharper than a very sharp sword. It distinguishes between soul and spirit. It aids in the healing of the body. It reveals my true intentions. Yes, it is the written words on paper that do all this. Of course, it cannot be done without the Holy Spirit, but He uses the logos of ink on paper to get you a rhema. Anything—ANYTHING—that attempts to get around the use of the written Word is leading down a destructive path. If you are one who is always looking for “a rhema word,” but you are not looking in the Bible, then the possibility of getting a pure rhema is slim at best.